There are several firsts for me with this coffee. 1. It’s the most variable coffee I’ve reviewed so far. 2. On opening the can, a chocolate smell escaped – but only the first time. 3. The first, and only first, cup had a hint of citrus in its flavor. Even though I currently weigh both coffee beans and water, and use a kitchen timer as the coffee sits in the coffee press, the coffee in the cup has varied from watery and weak, to so full tasting it feels like eating a meal. The only variable not fully controlled is grinding the beans before each cup. That’s never been a problem for me with other coffee beans. I can only guess the beans in this can, and maybe all cans for this coffee, are very delicate, producing these variations from cup to cup with only minimal differences in grinding. 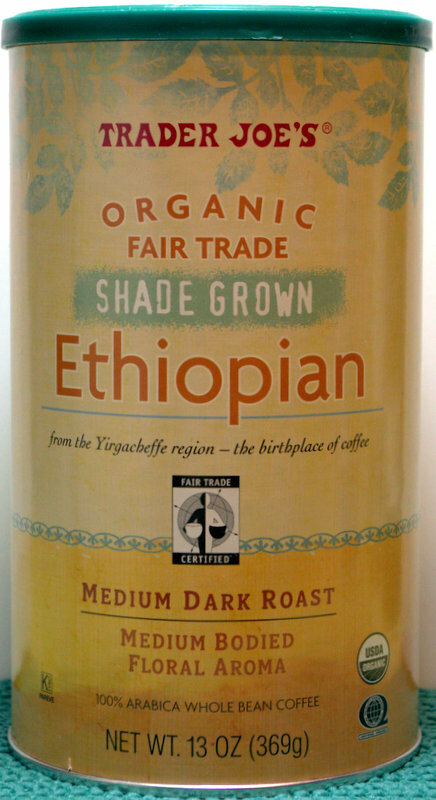 The Trader labels this coffee as coming from the Yirgacheffe region of Ethiopia, where coffee was first discovered. It’s also claimed to be organic, fair trade and shade grown. The coffee tastes good, even with the variability from cup to cup. It’s the richest tasting coffee I’ve tried when I hit the grind just right. That’s probably due to noticeably more very very finely ground coffee solids in the cup than other types of beans produce. I suspect if the coffee went through a drip coffee maker with a paper filter, many of those fine particles would be removed? At $9.99 a can it’s $3 more expensive than my favorite Trader Joe’s Tarrazu coffee and not decidedly better or worse. Even though my coffee horizons have been broadened with this coffee, I’ll be sticking with the Tarrazu for now. This entry was posted on 02/20/2015 at 09:04 and is filed under Recipes, food, cooking and related items, Trader Joe's. You can follow any responses to this entry through the RSS 2.0 feed. You can leave a response, or trackback from your own site.